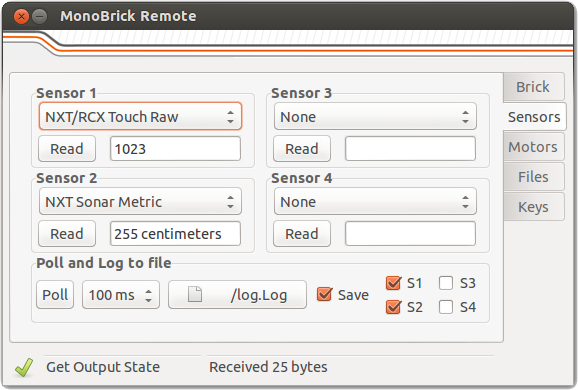 The MonoBrick Remote allows you to remote control your NXT. The programs uses The MonoBrick communication library and GTK# which means that it runs on Windows, Linux and Mac OS. 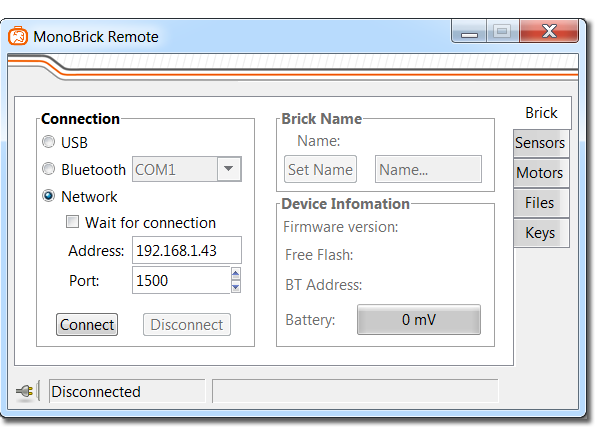 Besides USB and Bluetooth connection the remote also lets you connect to the brick over a Wi-Fi or internet connection using the MonoBrick Tunnel or the MonoBrick Tunnel for Android. With MonoBrick Tunnel for Android it is possible to stream video and see what your robot is doing. The remote lets you select between more than 20 different sensors, save sensor values to a file and control motors individually as well as upload and download files, start programs, use the mailbox system and play sound files. But the coolest part is that the remote let’s you assign keys on the keyboard to read sensor values and control a vehicle that can drive around the house. To control a vehicle simply select the two motors that drives your robot and set the turn ratio to determine how sharp you want your robot to turn. 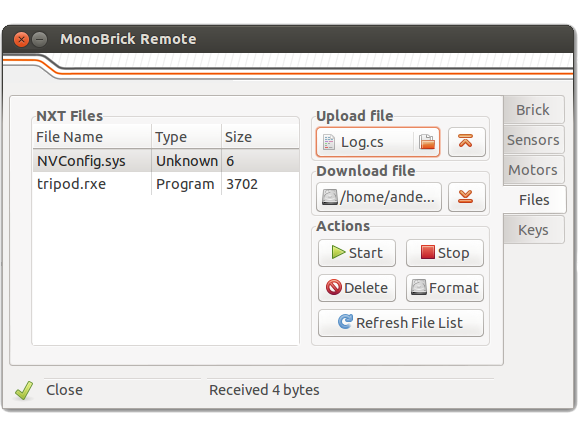 On Windows and Linux the MonoBrick Remote is distributed as a zip file while Mac users have a dedicated DMG installer – use the download link to get the latest version. Install the Mono Runtime from the Mono website. This guide might be helpfull. 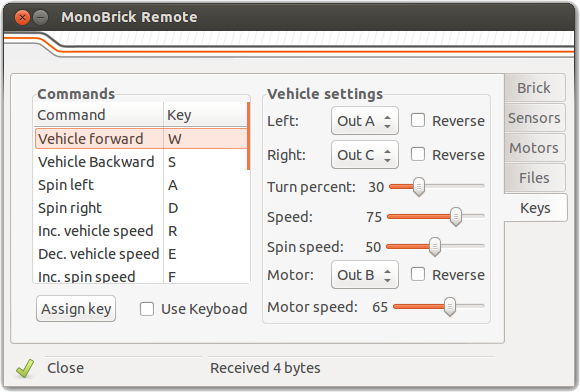 Questions related to the MonoBrick Remote can be found in the MonoBrick communication library forum. Hi. This ist great stuff. I’m using it in the classroom and my students love it. Thank you! Great to hear that. What are you using it for? Awesome remote, thanks. Definitely worth a $5 donation to support your work. Thanks a lot – I wish there where more like you! Hi Thanks for visiting my website. Have you installed GTK#. What are your specs? My students and I cannot get this software to work on Windows although the old NXT vehicle remote worked just fine. Can you please put the old version back up somewhere? 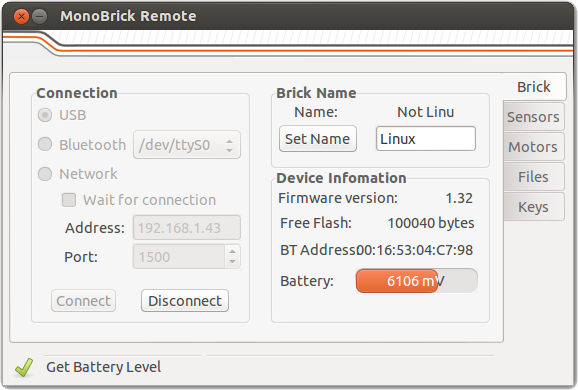 Thanks for trying the MonoBrick Remote. I don’t support the NXT Vehicle and uploading it to my website is not possible since the source code is lost… so let’s try and solve the problem you are having. What version of GTK# did you download? I tried both 3.2.3 and 2.10.X and we have Windows 7. It did not work. We installed GTK# either version, unzip the files to a folder, run the executable as an administrator and nothing happens. It just sits there and never opens up. This is the same problem for me as well as all of my students who have tried it. It would be great if you could offer some recommendations to help. Also, if you know of any other software that the students can use as a Bluetooth remote to set the keyboard keys to control the motors and read sensors that would be great. Never mind we got a different version of GTK# to work and we also found the old nxt-remote.zip file so we are good on both ends. Have a wonderful day! Great to hear that – what version of GTK# did you use? If it’s okay with Anders, would you mind sharing the original nxt-remote.zip for us NXT users? Thank you in advance. Thanks for the reply Anders, but my post was really directed towards CABERRY, who had posted “we also found the old nxt-remote.zip file so we are good on both ends”. I was hoping that CABERRY would be willing to share the nxt-remote.zip file that they’d found. I’m still using NXT and would greatly appreciate it if someone (CABERRY or anyone else that might still have a copy of it) could make that available. Thanks again. Great Work Anders….it took me a few minutes to geti this amazing app to work. The only thing i cant accomplish is the video streaming. I got the right ports settings on my Phone (SG3) VLC installed…the latest versión…but when i start the streaming, VLC opens and after a few second it says : “Failed to receive image data”….i got the windows firewall off…but nothing happened. Whay am i doing wrong?? Video data is streamed over UDP so make sure that your router allows you to forward UPD data from your phone to your PC. My guess is that your PC is somehow blocking UDP data on whatever port that you select for the image stream. If the router seems to be correctly set up try to use Wireshark to check if you receive UDP data at all. 1. Make your phone act as a wireless network to eliminate the router between the PC and the Phone. Make sure that the wireless network that you are creating on your phone has no password. 2. If 1 fails try to make the phone connect to a client (PC). See the “Running the tunnel over a 3G network” section on http://www.monobrick.dk/software/android-tunnel/ for instructions on how to do this. I hope that this gives you something to work with. Let me know how it goes..
We are using Gtk# for .NET (New version compatible with Xamarin Studio) and this worked for us although we have Windows 7. If you would like to see how we use the NXT and vehicle remote in my class, please see the following link. Darrin I will send a link in a moment to the old NXT vehicle remote. Here are two links to the NXT-Vehicle remote.zip. Thank you very much for this, CABERRY … very much appreciated! Loved your Bowl-a-Rama video. Looks like your students really enjoy what you’re teaching. it seems to be a good work man! What version of GTK# did you install? I just updated the download link so it points to a specific version of GTK#. I just used this version on a completely fresh Windows 7 64 bit installation. i installed it but still the app wont start. 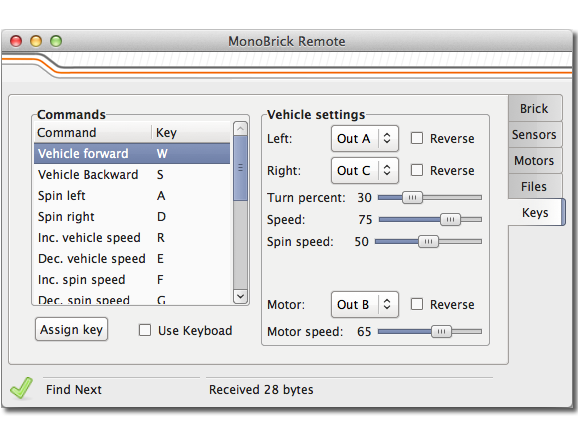 i am talking about the ‘MonoBrick Remote1.4′ thing. I can’t seem to be able to find the EXE for windows. the tutorial wasn’t specific enough. Did you use the download link and unzip the file? does this work for ev3 as well? It is on my to do list – but it does not support EV3 yet. The laptop connects without a problem and my phone does too, but when i wan’t to video stream it launches VLC but after 5 seconds it says no image recieved. I tried doing it on a wifi spot from my phone but it still didn’t worked. We also tried to use wireshark but we couldn’t see any UDP data but were not completely sure. Can you help us please? it would be awsome if will work. I have linux pc so I did that 3 steps but in 3. step my computer doesn’t do anythink so I tried to open thar .exe file with monodevelop, but there is a C# programming language and I don’t want it, I want it like it is on the picture. And have I download that GTK for linux to let it work? When I downloaded your GTK, my Norton antivirus classified it as safe but when I ran your Monobrick Remote and Tunnel, Norton alerted it as suspicious and they claimed it to be a Trojan virus file. The applications won’t work, even though I run as an administrator. When I turn it on, it will show a command prompt showing the word error. Is there anything wrong? I used 7-Zip to unzip my files. It shows: ‘failed to read settings. Using default settings.’ and then a ‘log’ (a txt. file) appears in the folder. 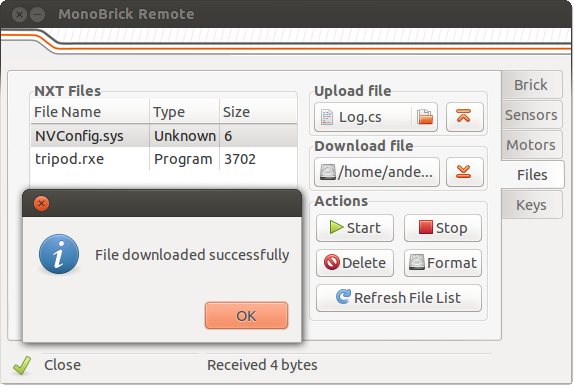 I also use the latest version of GTK downloaded from the Mono website, not from the Monobrick website. Please post questions in the forum! WHEN I TRY TO OPEN GTK# IT SAYS “THIS SETUP REQUIRES THE .NET FRAMEWORKS 4.0″ WHAT DOES IT MEAN?!! It won’t let me run on windows 8. Might be administration, but it does download all three files. I got it finally to work on a Windows XP laptop. This is a great programme! Thanks a lot for writing this. Me funciono muy bien para Windows 7, primero hice una carpeta en el escritorio, descargue GTK# for .NET e instale, después descargue MonoBrick Remote y guarde en la carpeta antes creada, inicie la conexión vía Bluetooth de mi PC al NXT y el puerto por el cual se conecto, después ejecute MonoBrick y seleccione el puerto y listo, el programa es intuitivo y funciona muy bien, gracias. I feel like a noob leaving a stupid question, but how do I launch the remote? I download the file, which was a Windows Installer Package, and installed it. There is a folder in Program Files (x86) called GtkSharp, but I cant find any launcher. 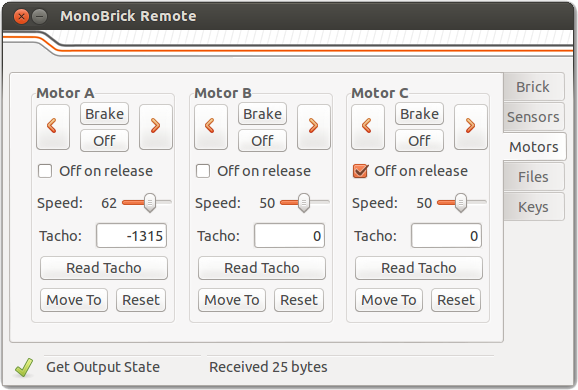 Can someone please tell me how to launch MonoBrick Remote? Wish i could donate but i am a kid!!! Do you have a IOS version for the camera? Remote doesn’t work on mac os (10.9.5) Says this program might be damaged or incomplete… ?? I’ve installed mono runtime as described. is there a way to do this for ev3? like did anybody make a website download yet?